RelaySoft is known to be an adware helper. If you want to find out whether it is really installed on your computer, you should definitely check the %ProgramFiles% directory. If you are sure that RelaySoft is present, you should definitely hurry to remove this adware helper from the system. Adware helpers only help advertising-supported applications to work properly, so RelaySoft is not going to act beneficially for you. We think that you agree with us that there is no point in keeping this adware helper. If we are right, make sure that you remove RelaySoft as soon as possible. We have prepared the instructions for you, so you are free to use them in order to remove this undesirable software. If you wonder what adware helpers do, you should know that they simply protect such information as adware settings, files, and registry keys. RelaySoft can also be used to restore the aforementioned information and it might even reinstall infections which have been installed on the system with a help of InstallRex installers. According to our security specialists, this adware helper uses various names, for instance, it might appear on your system as StatEngine, FalconCentre, and GrubTartan. It does not matter that RelaySoft uses different names because it acts the same in all the cases and it is still necessary to remove it. In most cases, RelaySoft adware helper helps such programs as Unideals, UniSales, and YoutubeAdBlocker work as they should, so it is very likely that this adware helper enters the system together with them. You should be very careful in the future in order not to install similar untrustworthy programs on the system. The easiest way to prevent malware from entering is to install a security tool on the system. Keep the tool enabled and you will definitely not allow adware helpers or other much more serious infections to enter your system in the future. 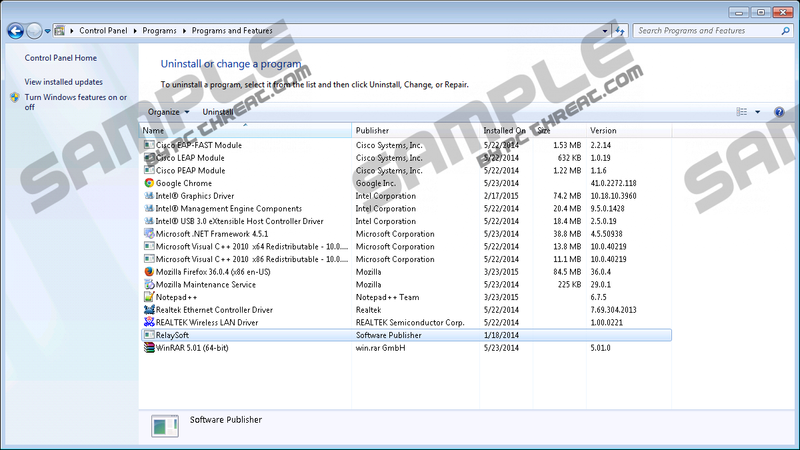 RelaySoft can be removed via Control Panel; however, you can also delete this adware helper automatically. If you decide to get rid of this software yourself, you should know that you can use our manual removal instructions. You will find them below this article. If you are going to remove RelaySoft automatically, you have to acquire a trustworthy antimalware tool first. We think that SpyHunter is the best choice because it can erase different kinds of infections very quickly. In addition, it will not allow malware to enter your system in the future. Tap the Windows key + X simultaneously. Click the Uninstall button to remove it from the system. Quick & tested solution for RelaySoft removal.